Adharshila Learning Centre is a unique school for adivasi children in Madhya Pradesh that views education as a tool for liberation...and a place of fun. The Adharshila Learning Centre was started in 1998 by the Veer Khajiya Naik Manav Vikas Pratishthan. The children have an active role in running the school. If you are interested in knowing what keeps us busy at Adharshila all year round. We are happy to send you Adharshila’s Annual Report for the academic year 2008 -09. We take this opportunity to thank you for the support you have extended to Adharshila. Due to your invaluable support for the last eleven years, hundreds of adivasi children of Barwani, Jhabua and Burhanpur districts of western Madhya Pradesh have been able to get an education which they could never have dreamt of. This year has been an year of terror and shock inflicted upon humanity. The terror emanated from fundamentalist ideologies - religious and economic. This has convinced us more about our project of promoting values like humanism, secularism, selflessness, equality, strengthening of community life etc. through education. It has firmed our resolve to take the work of Adharshila forward towards creating a more just, equal and humanitarian society as opposed to a society of atomized individuals motivated by consumption and greed. We feel there is an urgency to spread these ideas amongst children and youth – who are going to be tomorrow’s leaders. Once again thank you for taking part in this process of change and looking forward to your continued support and inspiration. The school started on 25th June 2008, with the onset of the monsoon with 60 day scholars and 90 in the hostel completing the quota of 150 students. This year was lucky for us. We got a MSc. (Math) person who took care of middle and high school student’s, science and math classes for 6 months. One more for primary classes joined us. In addition to these we had a strong team of about 20 student teachers (senior students studying from 8th -12th classes). Majali, an ex student took the responsibility of co-coordinator of the primary section. We were fortunate to have five volunteers from PRAVAH, INDICORPS, ahmedabad and individuals, who helped the children with English, Math, Craft, documentation work and generally in running the place. The many visitors from various countries and states also helped the learning process of the children. One old student who stays and helps in running the show at Adharshila got the 2nd position in the first semester of college. He missed the first just by 1% Two others from this batch are preparing for the PMT exam and keep in touch with us regularly. Two students passed the 12th exam, one got 70%. Another came 2nd in the district in the excellence school admission test. Many of our students who joined the Govt. Schools are doing extremely well. The Chatli High School Principal openly confessed that their school was getting good results because of students from Adharshila. Adharshila is known not just for the good performance of the children as compared to the surrounding schools but more so for the learning opportunities it creates outside the classroom. Art and craft : Children did a lot of craft work this year. One of the volunteers along with one of our own craft teacher helped the children in learning many types of crafts with different materials. A regular art and craft class was run, where children did origami, greeting card learnt jute knitting, etc..
Health and Body Awareness - Rinchin a social worker from Bhopal held a four day workshop on Body Awareness and health. Story Telling and Criticism - Rinchin also held story telling sessions of stories she had written while she was working on a health programme in our district. Muriel, a children's story writer and also a parent, home schooling her daughter also demonstrated how stories can be used to teach social science topics to children. Film Making - Kavita, from Drishti, Ahmedabad held a 4 day film making workshop. 22 students and teachers participated in it. They were taken on a learning journey from story writing to handling the camera. They took shots for a film on Adharshila. This process will hopefully continue the next year also. 3 Anita, Jamuna, Revali and Sunil went to the Sampoorna Kranti Vidyalaya, Vedchi, Gujarat for one month, to learn the full process of cloth making by hand right from cleaning raw cotton, ginning, spinning on the Amber Charkha, and weaving on a small Manipuri Loom. They also attended the Gandhi Mela in Surat - a big affair where many organizations participate. 3 Majali attended a two day women's workshop in Nagpur. She got an opportunity to understand the problems of women's organizations in Madhya Pradesh, Maharashtra, Delhi etc. 3 Shobharam Kanouje, a senior teacher at Adharshila and Dinesh a student went to attend a two day training held by a reputed NGO in Pune, to learn about generating electricity mechanically. The workshop did not turn out to be as productive as we had thought, but they got an idea. 3 The senior students observed the process of elections. This was a new initiative where the organization did meetings in the district to convince people that the candidate should be selected by the community and not by party leaders sitting in Delhi. Students were very involved locally in many fields. Taking part in events and organizing them is a great for confidence building, self esteem and developing leadership skills. 3 The music team performed before at audience of 25-30,000 at the Narmada Maha-rally. They also participated in an election awareness campaign for six days with the Adivasi Mukti Sangatan(AMS) a local people’s movement on. 3 The Adharshila Band was at it's peak during this season. In general it was a musical summer. With the music team they recorded a lot of music. From a distance or listening to the recordings nobody can guess the instruments. 3 A student also spent a month as a volunteer at the AMS office. 3 The cricket team lost to the Sendhwa Public School team by 17 runs, while in chess, our team notched up 4 victories. Our two chess losses came at the hands of opponents twice the age of our students. 3 Three students, Sitaram, Suresh and Majali, received awards in a Hindi essay writing contest, while student-teacher Kamal placed first in his college exams. This period also saw regular music, dance and art teachers join our staff. In all these events the students and children help in organizing the event according to their age. Sports Day - This is easily the happiest week, with children practicing, preparing the ground and anticipating the gifts( prizes). Children from 6 schools participated in the sports day. For the smaller children most games were non - competitive and in the end everybody got a gift. Tantiya Mama Kabbaddi Competition - This event was started last year for the village youth, who have to rely on 3rd grade films or liquor for entertainment. The good thing about this was that it was organized purely by the senior students and teachers. Eight village teams participated in the event. Cash prizes worth Rs. 3000 were given to the winners. Primary Section Annual Function and Parents Meeting - Usually this is a big affair at the end of the year. This year we changed the practice and called the parents at the end of each term. The children put up a show to tell what they had learnt in the term. They also exhibited their work through charts and displayed the craft work that they had made. In an in-house meeting with the children of the primary section at the end of the year the small kids told about their impressions of the year. Many of them came up with complaints of beating by elder boys and the elder boys apologized. Everybody was overwhelmed by the way the small pips were standing up and speaking up. Nobody felt bad at the complaining. A report with grades and the child's general progress was also given to the children and discussed with the parents. Many festivals were celebrated at the campus. Like every year this year's holi was a zabardast affair. This year the school was not closed. The full gang was there. Holi is very special at Adharshila because the students, big and small, freely throw mud, ash, water and colour on the teachers and other elders, sparing no one. It is really a time to forget who we are and indulge in true child like enjoyment. During Diwali, students learnt to make chandeliers from recycled materials, as well as rangoli and wall painting. They also learnt to make gujia and puri sabzi. All the local festivals are also celebrated. Teacher Trainings3 At the start of the new session, a five day training was organized where 14 teachers from Adharshila, Rani Kajal Jeevanshala, Dist. Alirajpur and from schools affiliated to Adharshila were present. These schools are being run by people's initiatives. The main theme of the training was about making the school a place to promote democratic, secular and progressive ideas. The project approach of teaching for the middle sections was also discussed. 3 Two boys from Jagrit Dalit Adivasi Sangathan and one from Burhanpur Sangathan stayed with us for two months for training after which they started schools in their areas. 3 Teaching through stories : Muriel, a children's story writer, published by Scholastic, spent ten days at Adharshila. She worked with students and teachers, exploring the power of stories as learning tools. She also trained the teachers, to harness the potential of storytelling. 3 A one week shivir for our teachers/ student teachers was held ( 3 hrs/ day) to remove the doubts about Adharshila or the fear of not following the regular system. a. English poetry collection for Levels 1 - 3. We are making small poems in English based on themes familiar to children there. b. Hindi poetry for Levels 1 - 5.
d. English teaching books based on phonetic system - Level 1and 2.
f. Activities and lesson plans for 8 topics were prepared for 6th - 8th grades. g. The teachers wrote out there weekly plans for two terms ( about 6 months). Of these the programme for the two smallest groups has been typed out for the full year. Next year the teacher will get a ready planner and will be able to spend more time on thinking about teaching methodology rather than content. a. A Children's Magazine, Baal Oorja –Four issues of a children's magazine - Baal Oorja were taken out. One of the volunteers helped in this. The last issue was taken out completely by a senior student. He learnt to do the layout through this. The matter was written completely by the children of Adharshila. We invited articles from other schools but nobody responded. b. A book based on the malnutrition and food availability survey has gone for publication. This study had received first prize at the National Children's Science Congress last year. c. The children chose a topics of their interest., researched it and made their own books. Some children illustrated them also. d. We published the books for the primary section ( in-house ) mentioned in the Curriculum Development section. We are constantly trying to convince people's organizations to start rural schools through people's initiatives. One new school was started in Burhanpur and another in Barwani district. The teachers for these schools were trained for 2 months in Adharshila. Due to the insistence of yeas in Adharshila a yoga shivir was organized. The theme of the shivir was - ' Youth is the future of India but what is the future of Youth' About 25 boys and girls between 16 - 20 years from 8 villages attended the shivir for 2 days. The shivir concluded with discussing ways of increasing the learning opportunities for youth in villages. They listed many things which they wanted to learn ranging from herbal medicine to film to moths. Sale of farm products - A preliminary meeting of farmers was called to discuss ideas to sell farm produce directly to consumers in cities. The people were positive and even collected about 50 Kg. pulses and 5 Kg. haldi. Like every year, organic farming was one of the main activities that engaged children all the year round. This year we sowed jowar on an experimental plot of 500 sq.m ( 5 gunthas) and got 2 quintals. This is pretty good for a start. Besides this we harvested 7 quintal vegetable and 3 quintal daal and fodder for 5 cattle. We did not have to buy for at least 3 months for the mess feeding 100 students. Through this the children learnt many practices of organic agriculture which they practice at home also like making Jivanamrut – an organic fertilizer, mulching plants with leaves, composting and making organic pesticide from leaves etc. They also learn principles of science, ecology and problems of farmers through this work. Small plots were allotted to children’s groups where they grew vegetables. Drip irrigation, brought from Wardha was also tried in the tomato plot successfully. We also sowed coriander on a large scale specifically to raise money. The crop was great but the price was so low that it barely fetched the cost of seeds and transport. The cow gave birth to a calf taking the tally of animals to 5. We got about 250 lit. milk for the mess. 1000 saplings of Garside, Sesbania, Papaya, perennial Tuwar, Jungle Jalebi, etc…were grown in the nursery which was set up in March 2008. Of these 700 saplings were planted by students and parents. Of these 400 were saved by the end of the term. It was a pleasure seeing the teamwork and dedication of the small children who took special interest in developing small plots of trees, where they sat for hours after classes. A nursery has been made to develop plants for the next season. 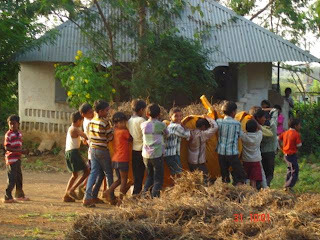 Baal Melas - Baal Melas, performed in villages engaged nearly 400 children for the whole day in various fun and science activities. Cycle yatra : 12 students from Adharshila went on a 5- day cycle yaatra which covered 200 km .The main purpose of cycle yatra was to learn about the state of education in the villages. Students held meetings, sang songs and exhibited posters. Youth Groups : A dialogue with the youth of Sakad village was started by the volunteers. Though a concrete group did not form but a good relationship was formed. 3 Participation in dharna : About 30 students of middle and high school of Adharshila participated in a protest against irregularities in the running of the PDS shops of the area smoothly. 3 Our music team performed in front of a 25,000 people at the NBA rally in Khandwa. 3 Adharshila's Naatak India Company performed yet another hit play in the Barela Pawra Adivasi Sammelan held at Pansemal. 3 A meeting for the members of Jagrit Adivasi Dalit Sangathan, M.P. was held to explain to them the problems of the present education system and ways of bringing about change in it. The theme was explained with the help of songs and a poster exhibition. They have decided to start a people's school. 3 A teacher and two students were invited to be facilitators of a children’s workshop on craft hosted by the NGO Muskaan in Bhopal. 3 Three other students represented Adharshila at a crafts workshop hosted by the Rani Kajal Learning Centre in Kakrana. They also took the opportunity to explore the history of people’s movements in the area. 3 We volunteered to make a ring tone and record songs for the election campaign of an independent candidate. 3 Jayashree went to the women's workshop in Nagpur as a resource person. Primary health is one of the subjects which have been pursuing keenly. This year we took a number of steps to increase awareness about health issues amongst the students of Adharshila and surrounding villages. 3 This year too the middle school children studied primary health as a subject. Primers prepared by reputed organizations working in the health sector viz. CEHAT, Nirantar and VHAI were used. 3 The exhibition on malnutrition was shown in schools in surrounding villages. The exhibition was also shown during the cycle yaatra. The villagers watched the exhibition with great interest and had a lot of questions for the children. 3 Rinchin, from Bhopal who is active in campaigning for various health issues conducted a 3 day workshop for elder children. She did a body mapping exercise and explained the principles of preventive health to them. 3 Two students chose to take health related topics for preparing project reports for their final evaluation. 3 One student went to Gujarat and stayed for 15 days in a rural hospital run by Arch Vahini a reputed NGO working in the health sector. He used the skills learnt there throughout the year dressing wounds not just of children but elders also. 3 At least three discussions were organized with the senior students on health related issues. One of these discussions related to the debate in the parliament regarding giving biscuits to children instead of mid day meals. Another related to chronic malnutrition in a district of MP and the govt. decision to give them special nutrient drops to be mixed in the dough to fight malnutrition. Very interesting and heated discussions took place. 3 A book on malnutrition has been published based on a food availability study done by students in surrounding villages. 3 We started the process of making guidelines for a health curriculum for primary and middle classes. Even after doing all this there are questions in the mind - where is all this leading to ? What is the contribution of Adharshila in building a more equal and just society ? Review of Adharshila' work and Exploring new possibilities - We invited Shri Dutta Savle an experienced activist, to review the progress of our work and explore new possibilities. He was with us for 5 days. After a lot of brainstorming and reflecting on past experiences - ours and others, it was decided to start separate activities to engage the youth of the area. The youth shivir was one of the outcomes of this. It was felt that the school part is also necessary and should be systemized further. Talking to him was a very rejuvenating experience. He was very hopeful as education is a long term investment programme and does not show immediate results. 3 A new classroom for small children was built. 3 Books worth about Rs. 5000/- were added to the library. 3 3 new almirahs were built and installed in the main building. 3 The installation of a transformer also meant regular voltage, even though electric supply is still sporadic, that allows for the running of several laptops for several hours. This has allowed, among other things, regular computer classes for 8-10 students. 3 We also experimented with a bucket latrine as a replacement to our septic tank system.. As narrated on our blog, the project was eventually abandoned for a lack of volunteers to do the necessary maintenance. 3 20 young Indian Americans were here for 8 days to know about alternative ways of learning and trying to understand the problems of rural India. 3 Shyam Kansal - A rice mill owner from Orissa stayed with us for three days to discuss the possibilities of starting a similar venture in his place. 3 Muriel and her daughter who delighted the children with her stories. 3 Netta- An Israeli girl interested in Nai Talim education and how it could relate to her country. 3 Shelley- The editor of The Monthly, Australia’s most eminent political journal, along with her brother, passed by. 3 Eames Demetrios, an American documentarian, storyteller and designer. 3 Jordan a photographer from Canada spent three days with us. 3 Abhinav a graduate in electrical engineering stayed with us for 5 days. He also wants to open a school near Jabalpur..
3 A team of students, teachers and coordinators from Hunar Ghar, Rajasthan, stayed with us for a week. 3 A team of Karyakartas from Orissa Jan Adhikar Morcha from Orissa, spent a day at Adharshila. 3 Winter Birds: The Wagtail from the Himalayas, the Green Bee Eater and the Black Drongo. Our students took the opportunity to interview our guests and learn all they could while they were here. Shri Eams Demetrios, Ms. Michelle and Shri Sebastian, Shri Usha Kant Varma,Shri and Shrimati Sodhi, Jojo, City Automation Pvt. Ltd., New Delhi and Shri Shyam Kansal for their generous financial contribution to Adharshila.